This year, Nazareth Academy High School in Northeast Philadelphia, located along the Philadelphia-Bucks County border, is celebrating a landmark in its history: 90 years of preparing girls for college and beyond. At the same time, the all-girls college preparatory school is embracing a host of changes designed to enlighten, enrich, and inspire its students. To begin with, Nazareth has brought on Jim Meredith as its first-ever lay principal. Meredith comes to the school with a 20-year history of work in the Archdiocese of Philadelphia. At the same time, the school is revamping its STEAM (science, technology, engineering, arts, and mathematics) initiative as STREAM, to include an emphasis on the religious traditions upon which the school was founded in 1928. In line with this renewed commitment to feeding students’ ever-evolving interests, the school has also begun the process of creating a Makerspace in which students can utilize advanced technology such as 3-D and laser printers. 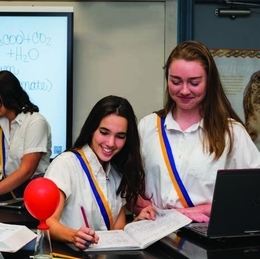 Nazareth has always offered academically rigorous courses of study in science and math, and the school’s fine arts program is renowned for fostering creativity among students. The intersection of these disciplines is where the real magic happens, according to LePera. Nazareth’s reaffirmation of its dedication to cultivating a well-rounded student body comes on the eve of the school’s mid-October evaluation by the Middle States Commission on Higher Education. Members of the Nazareth team have been collaborating for months in efforts to bring STREAM to life, science teacher Amy McDonald explains. McDonald emphasizes that none of these advancements would be possible without the unwavering support of Nazareth’s administration. With a strong focus on service to God and to the community, Nazareth continues to find new ways to inspire its student to achieve academic excellence, to become lifelong learners, and to become active participants in a global society.